Shree Investment & Finance came up with a new and advance outlook with the varities of innovative products and services. We also provide one window service to serve customer with quick and easy documentation in account opening and getting credits and other facilities in very competitive and negotiable rate and charges. Leader in global payment services. From small businesses and global corporations, to families near and far away, to NGOs in the most remote communities on Earth, we helps people and businesses move money to help grow economies and realize a better world. We provide the Clearing, IPS and SMS Alert services to our customers. Electronic Cheque Clearing (ECC) and Interbank Payment System (IPS) are the payment systems that we have implemented as services to our customers. Customers can now subscribe to SMS Alert System by filling out a SMS Alert application form that receive. 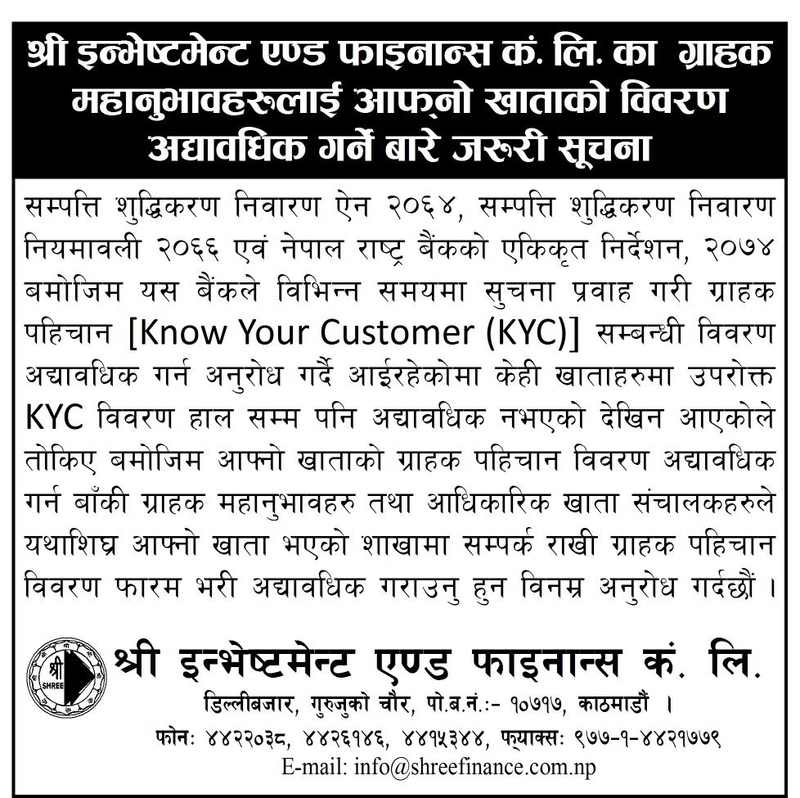 Shree Investment & Finance Co Ltd. was incorporated in the year 1994 (2051 BS) by a group of eminent businessmen from Kathmandu , as a Financial Services Company and a Merchant Bank under the Nepal Finance Company Act, 1985 and the Nepal Company Act, 1964. The Company has been licensed by the Nepal Rastra Bank as “C” class Financial Institution to undertake finance services and merchant banking activities in the country. We will continuously be innovative and keep up with changes to satisfy investors, staff, customers, regulators and the people of the community we serve.